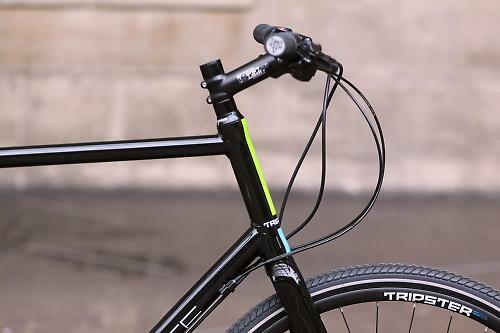 Kinesis' Tripster ACE is a good-quality all-rounder city bike that's well worth a look if you're considering a flat-bar commuter or general purpose bike. It's not doing anything particularly clever, it's just a well-specced and solid-feeling workhorse bike that's fun to ride and built to last. For a penny under £800 you're getting a Shimano Sora 2x9 drivetrain, Tektro hydraulic disc brakes, decent wheels and solid finishing kit all bolted on to a 6061 Aluminium frame and carbon fork. As a bike it holds together really well, and there's no part left wanting for lack of budget. You can get a bit better drivetrain components and finishing kit from larger manufacturers at this price, thanks to their economies of scale. But the Tripster ACE doesn't feel under-specced, and there's nothing that comes as standard that won't last. That's what the ACE in the name stands for. Realistically you'll probably doing the latter two more than the first one. This isn't really an adventure bike as such: although there's nothing to stop you lobbing a rack and panniers on and going off for a big old adventure, it's probably not top of your list. More likely you'd be looking at the Tripster for general workaday duties: commuting, leisure riding, the odd longer excursion or unsurfaced jaunt. It's well up to any of that stuff. The discs and big frame clearance give all kinds of tyre options. Our ACE came shod with 35mm Freedom trekking tyres and even with rubber that big, there's still room for mudguards. The 700c Tripster District wheelset will take a much narrower tyre though, if you're not planning to venture off the tarmac and the option to fit full 'guards means you'll be well set when winter comes. If you wanted to you could even go a bit bigger than the stock tyres and take the ACE proper off-road; it has a bit of the old-school MTB about it. In a good way. 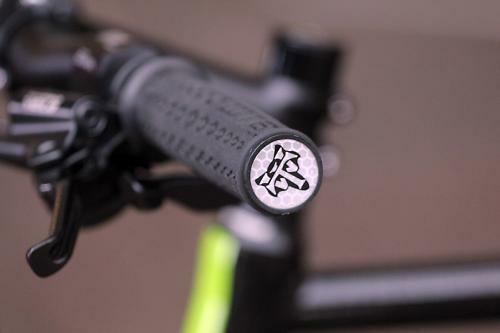 The alloy frame and carbon fork of the Tripster are reasonably stiff, which makes the bike a predictable beast when you're taking a downhill corner or stomping away from the lights. The big-chamber tyres offset that, and the result is a bike that feels quite direct while still remaining fairly comfortable for a longer ride. By 'longer' here I'm thinking 20 miles or so: this isn't a bike you'd stick top of your list for a century or anything. It's a fairly upright position which places more of your bodyweight on the seat than a racier hybrid like a Specialized Sirrus or a Boardman. The saddle is up to the job, thankfully. In reality most people will be looking at a bike like this for a daily commute or general duties, possibly on a cycle-to-work scheme. For that kind of riding, the position is more or less ideal. Everything on the Tripster ACE works well. 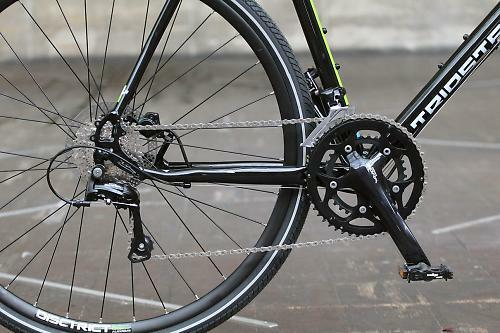 The 2x9 Shimano Sora drivetrain barely skipped a beat, as usual. The Tektro Vela brakes are fairly cheap but performed admirably, with plenty of power on offer and very little fade even when I was being deliberately naughty. 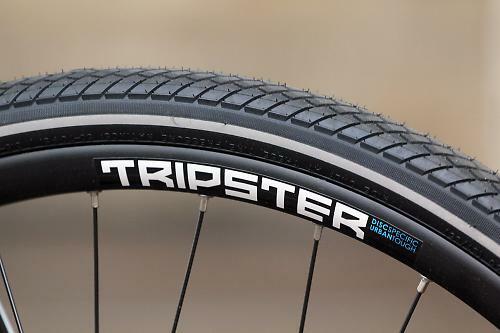 The Tripster-branded wheels are excellent: tightly built with good quality rims on Shimano hubs. They're not light – the bike as a whole isn't either – but they'll certainly last, and the big tyres do a good job of protecting them from damage. They have a reflective sidewall strip, which is good news around town, and that's complemented by the WTB grips which also have a reflective end cap for extra side-on visibility. The Tripster is best at cruising speed. At over 11kg it takes a while to get there, and it doesn't much like to be hurried on the hills, but if you're not in a desperate rush to get anywhere it's a great way to travel. If your journey involves getting off the beaten track a bit, then the ACE isn't fazed at all by that; anything short of proper rocky singletrack is handled with ease. For £800 you can have a sportier hybrid with Tiagra, one rung up the chain, but many manufacturers with more buying power than Kinesis are still speccing Sora at this price and as a whole the bike certainly doesn't feel like there's been any corners cut. 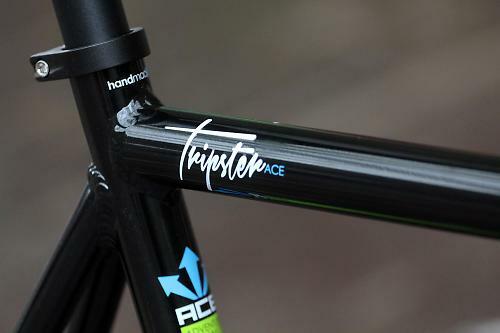 That's the most enjoyable thing about the Tripster ACE: that it holds together as a bike so well. 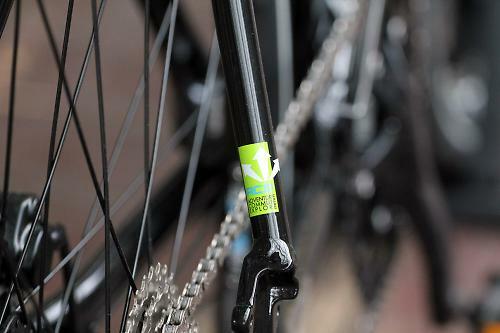 Selling whole bikes is a fairly new endeavour for Kinesis, who have tended to concentrate more on frame and fork. But they've nailed this one: there's nothing about the Tripster ACE you'd need to change: it works really well as a full bike, straight out of the box. The transmission is more or less faultless, the brakes are powerful, the wheels are strong and capable, the tyres are predictable. It's fun to ride, and quite versatile too. I'd certainly recommend it. 'ACE' stands for Adventure. Commute. Explore. If you love mixed riding & want something that's exotic, light, fast & versatile, look no further. Featuring a lower Bottom Bracket than a cross bike, making for a stable and swift on-road companion but with a more relaxed head angle making it comfortable off-road too. Hydraulic disc brakes mean fantastic braking in all conditions and reflective elements in the detailing will help keep you visible. Clearance for 40mm tyres with full mudguards (and rack mounts) give you plenty of options for use on road or off.